Pouchpack Handling System | PAK Automation Ltd. The Pouchpack Automatic Pouch Handling System automatically takes one to four pouches from a magazine, opens them with a robotic arm, fills them and then seals the pouches. This machine can be used in many configurations. The PouchPack can run layflat and/or stand up zip pouches. The pouches can also receive either a label or an ink jet code. Filling can be done by employees, robots or using scales. Pouch sealing can be basic, have air evacuation or gas flush. 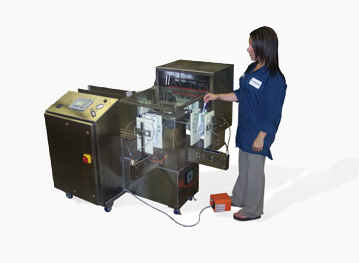 The result is a complete pouch filling system suitable for a wide variety of packaging applications, including seed, components, and biomedical devices. Pouch range size: Up to 12″ x 12″. Pouch configuration: 1, 2, 3, or 4 up. Power: 115 VAC, 60 Hz. Clean and durable, preferred in medical applications.